We’ve got another great monthly edition of the Wood News Online available for you to read, and we’re pretty excited about this one. This month we’ve got a great article about a sawyer and woodworker from Western North Carolina who works with a portable bandsaw lumber mill that allows extremely large cuts – up to 32 inches in diameter, in some cases! Gary Smith demonstrates some incredible carving abilities with his horse drawn carriage in our Show Us Your Woodcarving column, and Alex Entelis builds unique and beautiful kids’ toys in our Show Us Your Stuff column. We also feature Bob McConnell’s “Volunteer Workshop” in our Show Us Your Shop column. Morton’s got the new T18 Festool drill in his workshop for a product tour, the Down to Earth Woodworker experiments with a new design for storing his clamps before committing several random acts of woodworking, and the Lie-Nielsen hand tool giveaway is now open for entries! All this and more are ready for you to check out in this month’s Wood News. Go take a look! 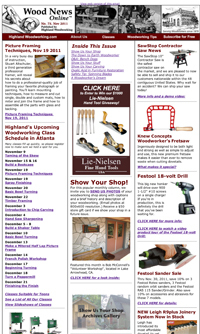 June 2011 Wood News: Now Available!